Just above a half page picture in the March 1971 Railroad magazine, is the caption "Monorail systems, of which this is a sample, are now being manufactured by Westinghouse Air Brake Co., of Pittsburgh, PA with a test site in Cape May, NJ. 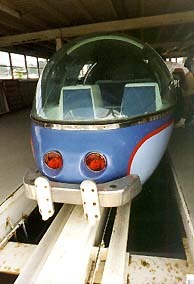 At present, only about 15 monorails are in operation on the globe. Of these, Universal Design (UDL), a WABCO subsidiary, built a total of nine and assisted with two others." On my1994 visit to Dutch Wonderland of Lancaster, PA, Park Operations Manager Tim Ober gave me a photocopy of this page after searching through the park's "monorail" file. Surviving Blue train of original three. Red and White were victims of fire. UDL trains are interesting in that they run on three surfaces of an inverted T-shaped guideway; load bearing tires run on the lower side horizontal surfaces, while a seperate row of tires grip the side of the vertical surface on the center beam. A motor mounted between each car powers the drive wheels. 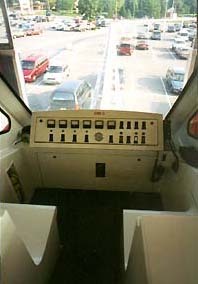 Bus power is supplied from between one of the lower surfaces and the higher center beam. 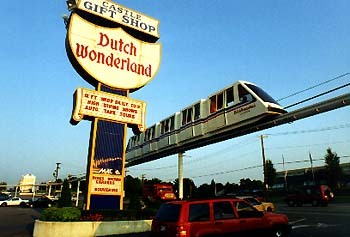 The steel guideway at Dutch Wonderland travels over and around the amusement park from a parking lot station, through an unused station inside the park, past what appears to be an emergency exit platform, past a switch to the spur into the shop side of the station and finally back to the main station. Since the old blue train resides in the maintenance bay, it is easy to contrast the old style with the new, taller boxy trains as they enter the loading station. Information on any of the following other UDL monorail trains would be greatly appreciated. 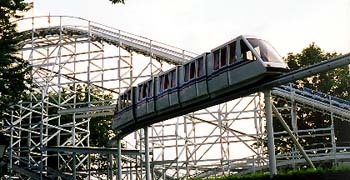 They operate(d) at The State Fair of Oklahoma; Geauga Lake of Ohio (now Six Flags over Ohio); Riverside Park in Agawam, Massachusetts; Wildwoods-by-the-Sea in Wildwoods, New Jersey; HemisFair in San Antonio, Texas; Philadelphia Zoo in Pennsylvania; and several of the Butlins Amusement Parks in Great Britain.